I know you have a story in you. It’s time to be the Hero of your Story instead of being Defeated by it. Writing my story was the single most important thing I did for myself . Sign up for your powerful and practical FREE report below by clicking in the middle of the photo. Then, you will have the opportunity to put your email address in and I’ll get your top 3 tips right to you. And…. Once you write your story you can then share your wisdom and insights with others. You’re going to learn so much about yourself and the main characters in your life by writing everything down. By fully inhabiting the characters in your life through my unique “SHOW” process you will finally be free of your judgments of even the most challenging antagonists in your life. Out of your head and onto the pages. Want to create your own one-person show or write your story into a book (like I did)? Step into Your Spotlight by signing up for your FREE Report (to the left) and when you do you’ll be on my private VIP list where you will receive personal videos, teachings and tips from me to support you on your creative journey. Brenda aka The Red Hot Contenda (for those who’ve seen my show you’ll understand this reference) **Don’t know the reference? Ask me about it on FACEBOOK. 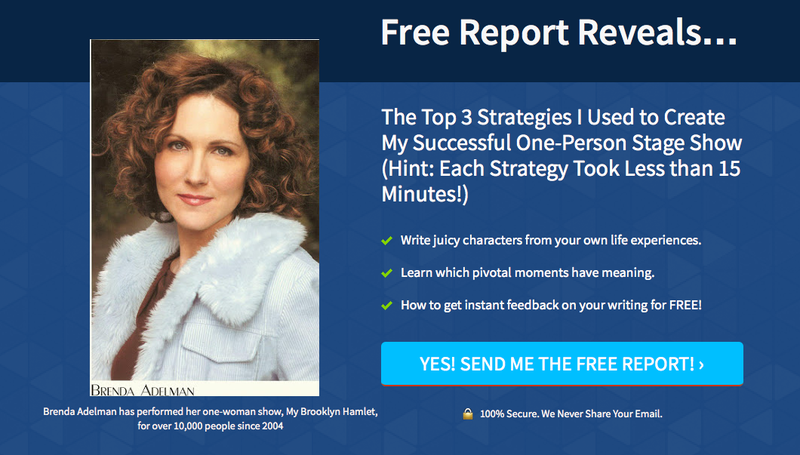 FREE 3 PART VIDEO SERIES REVEALS HOW TO SHARE YOUR STORY. HEAL. EXPRESS YOURSELF CREATIVELY AND TURN YOUR PERSONAL STORY INTO A BUSINESS THAT WORKS FOR YOU! Click Here to Get My Videos!